Illinois Comptroller Judy Baar Topinka has a 19-point lead over her Democratic challenger, Lt. Gov. 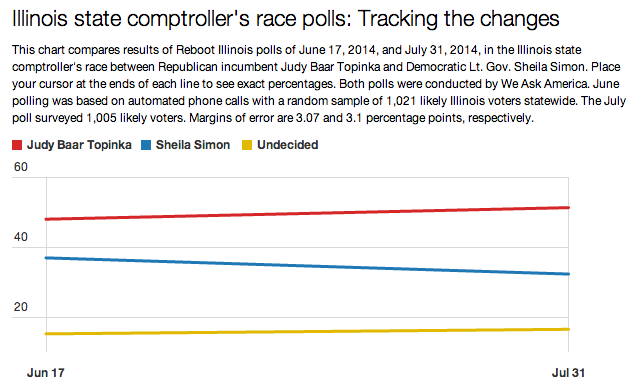 Sheila Simon, according to a new Reboot Illinois/We Ask America poll. The poll, conducted July 31 among 1,005 likely voters in the November election and with a margin of error of 3.1 percent, showed that 22 percent of Democratic respondents support the Republican Topinka, who also registered 31 percent among Chicago participants — a strong showing for a Republican candidate.